This will be an important week to keep an eye on the weather, there are a lot of things going on that will impact a major storm system expected to move into the area next weekend. This post will be a bit lengthy but I feel it’s necessary to try and explain what is going on and what it means. I’ve broken this post up into two sections: the first (usually the one most people care about) will be information on this storm. The second part, further down in the post will be for the folks who want to know more about how these storms are forecast and the mechanics behind some of the modeling. In the last week or so, we have seen hints a major storm system moving into Colorado by next weekend (April 15-17 time-frame.) So far the news outlets in Denver have done a pretty good job at not over-hyping this storm system but I imagine that will change as we go through the week. 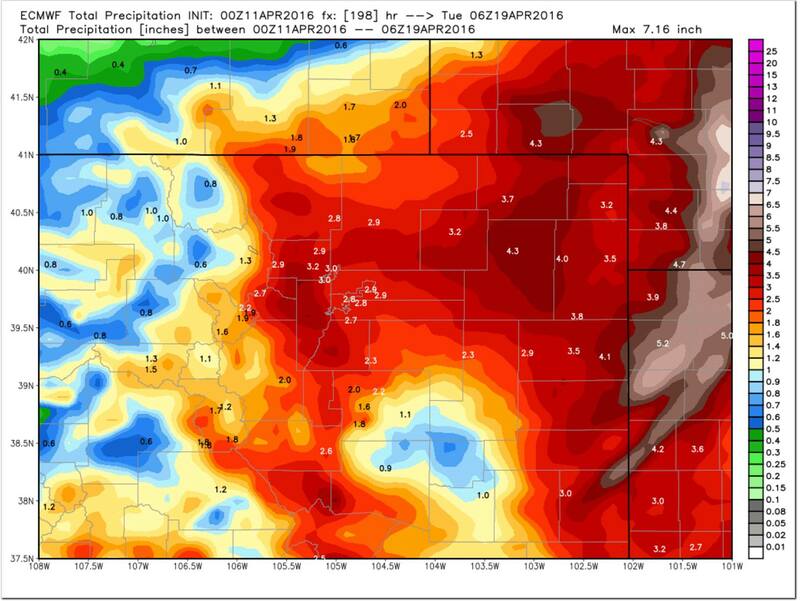 The Euro shows a strong low pressure system moving from North to South across Colorado. This system will bring much colder air and eventually tap into moisture as it moves across the state late this week. This is a strong system, it will be able to pull colder air from the North which may make it cold enough for snow. This is a huge question mark right now as other models predict less cold air and even the Euro questions how much cold air this system will be able to tap into. 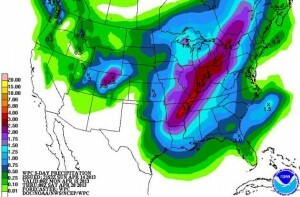 Every model agrees on the moisture with this storm. As it slides South, it will begin to tap into moisture flow from the Gulf of Mexico. Upslope flow is another ingredient all models agree on, this will enhance precipitation along the front range of Colorado. At one point this week, the Euro model was making this storm look almost apocalyptic. This snapshot of the Euro’s QPF (precipitation) yesterday showed nearly 5 inches of precipitation falling throughout this storm. If we take an average 10:1 ratio of snowfall (as is common for Colorado) we would translate that to somewhere around 50 inches of snow. If you’re curious how we look at QPF and snowfall, read the technical sections in the later part of this post. This is a huge number but also a number with a huge question mark. For this to realize, all of the moisture would need to fall as snow and there is not a ton of agreement on temperatures right now. This is an effect I affectionately call “Model bounce” and it means one thing: uncertainty. This storm is still a long ways out and models have a tough time with these things until they get into a closer range. So, do we get a massive blizzard? Do we have flooding rains? Does anything happen at all? Models across the board agree that a very large and powerful system will impact somewhere in the high plains of the U.S.
Where does the storm system set up? We don’t know as of yet whether Colorado will even be impacted from this storm. 100 miles North or South makes a huge difference! How cold does it get? If it stays too warm, nearly all of this will fall as rain. Any colder, it will fall mainly as snow. There is no reason to get too excited about this storm as of yet. If you’ve followed me for any amount of time, you know that I like to stay pretty level-headed and non-hype with my forecasting. We simply do not have enough data on this system yet and anyone that starts telling you we will get 4-5 feet of snow this early is very misinformed. Second, there are a lot of things working against this storm for snowfall such as temperatures and positioning of the low. However, the ingredients are all there and should they set up right we could have a dozy of a spring snowstorm on our hands. Keep an eye on your favorite weather source this week (whether it’s us or someone else.) If you follow us, we will have a ton of posts up this week as the forecast changes. If things begin to look serious later this week, we will give you plenty of notice to start preparing for it. 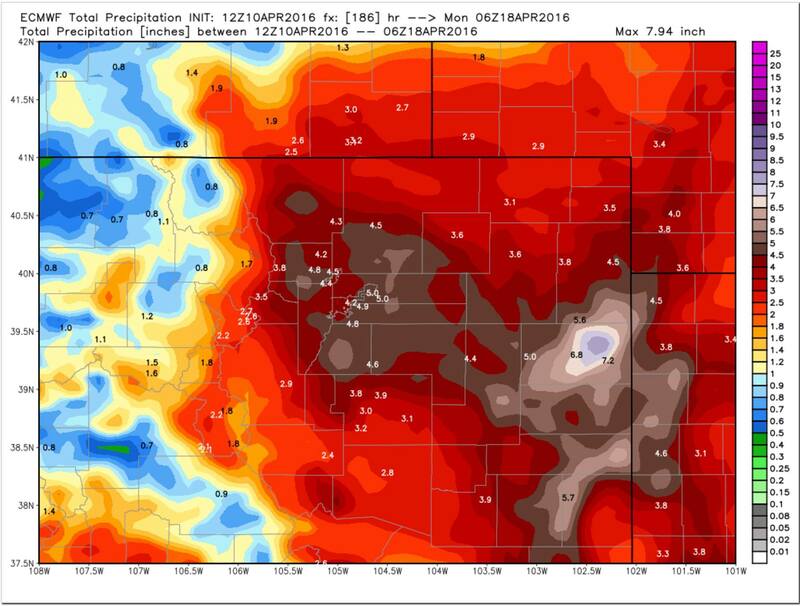 Quantitative precipitation forecasts is a product that weather models output that gives us an idea about how much liquid precipitation will fall. This literally means how much water will fall from the sky. In the summer this gives us a good idea of how much rain we may see over a period of time but in the winter and spring months for Colorado it gets a bit more tricky because 5.0 inches of precipitation does not translate into 5 inches of snow. For snowfall in Colorado we generally use a 10:1 ratio for snowfall; meaning for every 1 inch of QPF we see on a model we can expect 10 inches of snow from that. This is an average though and doesn’t always prove true, colder storms may see a 15:1 or 20:1 ratio, while wetter spring storms may see a 5:1 ratio. There has been a lot of talk on model accuracy as of late. Some models just seem to handle weather better than others and the overall accuracy across models may surprise you! 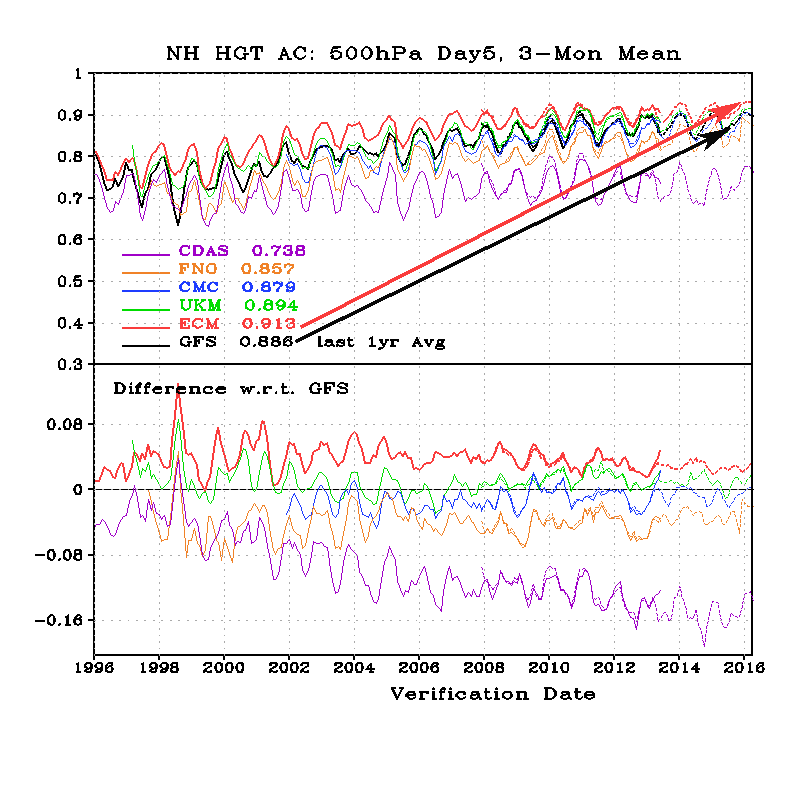 Here’s a look at the accuracy for models over the past year. The big 2 we often use is the ECM and the GFS. The ECM is comonly referred to by us Met types as the “Euro.” This is a model that ingests data from many different sources and creates forecasts across the world. The GFS is the American model created by NOAA and used by NASA and the NWS. 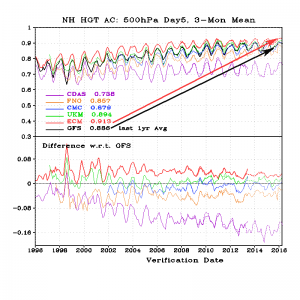 In recent years there has been a tendency to look harder at the actual accuracy numbers for these models. Many have said that the American models are falling behind other models in the world. You can see by the chart above that American models are not falling behind the Euro,they are in fact keeping up but they are just not as accurate. Both models have undergone upgrades in recent years and both have increased in accuracy but the Euro is still by and large, the front runner. There is a lot of facts and science about how these models are rated for accuracy but sometimes you just can’t replace experience. I’ve been following weather for nearly 25 years now in Colorado and I’ve picked up on some patterns with modeling for our state. When I forecast weather I tend to pay more attention to the Euro in the winter time. For whatever reason, it seems to handle our snowy storm systems better. For the summer months I tend to follow the GFS closer as it is often good at predicting severe weather setups and monsoonal weather as we approach the warmer months. Thank you Carolyne! Yes Larkspur is caught between that “too far South for Denver and too far North for the Springs” part of the news weather market. I try to cover those areas because you don’t get to hear much specifics for them on the news or online. There’s not even an official weather station in Castle Rock, all the data from phone apps and the news comes from the Centennial airport station. These are the experts in the business! Very interesting site, I’ve often though about doing private meteorology work but maybe that will come later. I’m surprised I haven’t run into these guys as I know a lot of the meteorologists in the area South of Denver and into the Springs. Thanks for the link! We really appreciate your weather forecasting (and your extreme levelheadedness). We live in the rain shadow of the Palmer Divide and miss soooooo many rainstorms, but just get creamed when the snow falls. 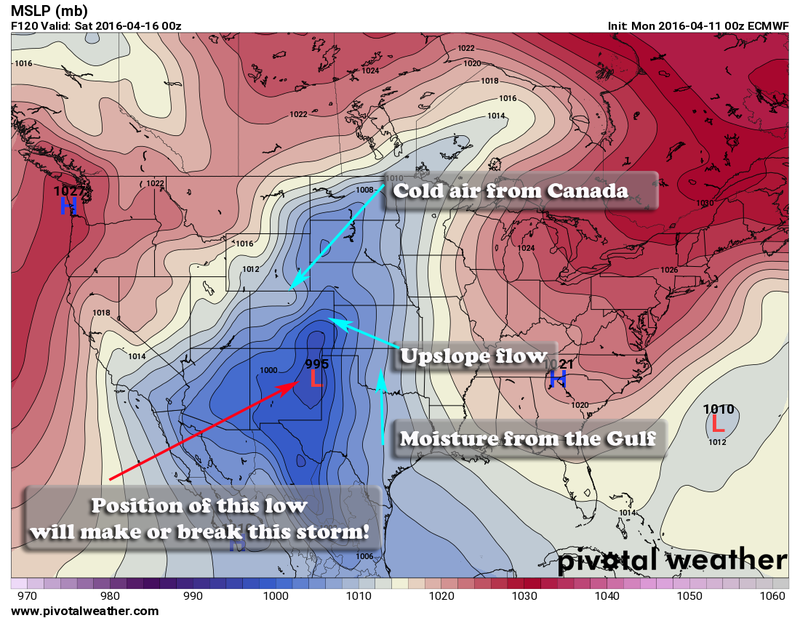 Weather is a big deal to us…especially during hay season. Thrilled to have a local forecaster, because the weather info from the Centennial Airport Station does not help us! Thanks for the kudos Cecilia! I’m glad you enjoy reading and I too struggle with the weather reports on apps and tv stations from Centennial. It was one of the main reasons I started the site (in addition to my huge interest in weather and storm chasing.) We know how different the weather can be at Centennial vs. Castle Rock/Larkspur/Franktown/Elizabeth and other areas along the Palmer Divide. Our terrain and higher altitude make our weather situation much different!